COCOLAB Loyalty Rewards Membership is effective from 1 April 2016 onwards and is valid until reaching 31 March annually. Membership is automatically renewed every 1 April for active members only. Active members must accumulate a minimum of 10 reward points in their Loyalty Rewards Membership Card before 1 April annually. All reward points from previous year will not be reinstated in membership renewal. Successful membership within the month of March will be automatically renewed to the next annual term. Reward points collected within the month of March for new memberships, which are short of qualifying for redemption vouchers, will be carried forward to the next annual term. Expired membership / inactive membership / membership which does not meet minimum accumulated points can be reactivated at RM20 in your preferred outlet. Minimum spend must be met in COCOLAB physical retail outlets in order to qualify. The COCOLAB Loyalty Rewards card does not act as a credit card. It must be used only be used by the person whose name is signed on the card and is non-transferable. Once you are qualified as a member you will be notified via email the details for card and welcome gift collection. Please allow 2 working weeks for your card to be ready once the minimum spend has been met. Collection of your COCOLAB Loyalty Rewards card, welcome gift, birthday gift, redemption vouchers or rewards must be done at your first registered outlet, known as your preferred outlet. In the event your card is damaged / lost / stolen, the member must report the incident to your preferred outlet. Reward points from damaged / lost / stolen card will be transferred to a replacement card. Change of preferred outlet is only allowed once within your membership and you must submit the request to your current preferred outlet. Please allow 10 working days for processing. You will be notified via email when we have successfully changed your preferred outlet. 5% discount is awarded only to members with successful application with the condition that their Loyalty Rewards Card is presented to the cashier at the time of purchase. 5% discount will not be awarded to temporary members who are accumulating the membership minimum spend or to successful members who have yet to collect their Loyalty Rewards Card. Discount will only be applied for purchases at COCOLAB physical retail outlets. Earn 10 points for every RM1 spent in COCOLAB outlets in Malaysia. Reward points are based on the net value after deduction of discounts or vouchers. Member must present COCOLAB Loyalty Rewards Card to the cashier at time of purchase in order to collect reward points. Failure to present your card will automatically void any reward points for that purchase. Reward points are only applied on purchases at COCOLAB physical retail outlets. Once reward points have been redeemed during Points Redemption Period* , it cannot be reinstated / changed / cancelled. Reward points earned must be redeemed only during Points Redemption Period * which will be stated by COCOLAB before 31 March each year. Balance of points cannot be carried forward. Reward points can only be redeemed once per Points Redemption Period. *COCOLAB reserves the right to stipulate Points Redemption Period and the frequency of the Redemption Period. Members entitled for vouchers will be notified via email and they can be collected or used in your preferred outlet only. Vouchers will only be awarded if certain redemption criteria are met (eg. Birthday Month, qualified accumulated points). The management of COCOLAB deserves the right to amend the Birthday Gift choice at any given time or month. Such birthday gifts are not exchangeable for other items of similar / same value. Understood that COCOLAB (COCOSCIENCE SDN BHD) reserves the right to amend or withdraw any terms & conditions without prior notice. Any change in address, email address, phone number, or any mode of contact should be notified to your preferred outlet as this may affect your membership reward points. It is the member’s right to ensure that information given is correct as of registration time in order for us to effectively communicate to you. COCOLAB will not be held responsible for any issues arising from failure of communication due to wrong registration information, e-mail delivery failures or spam box delivery, no-response via voice communication or telephone. Members are held responsible for checking any form of communication used by COCOLAB to notify them of updates in the Loyalty Rewards Program. 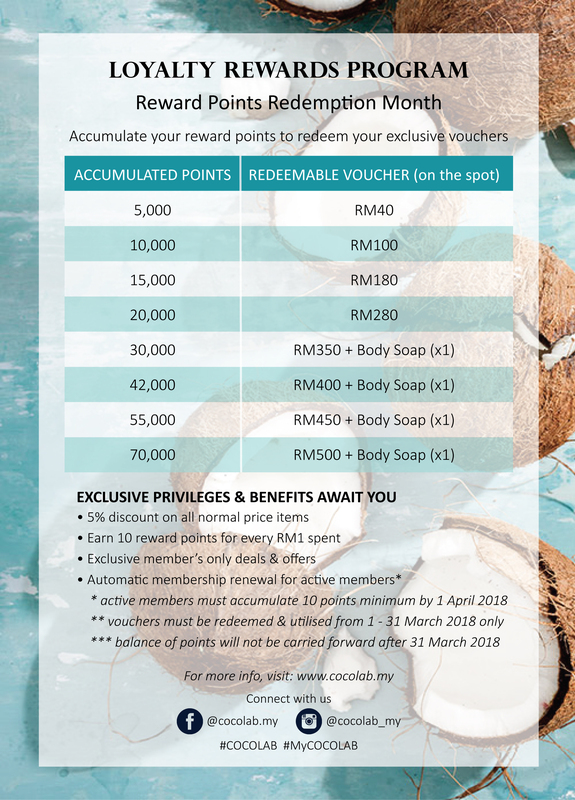 Any new terms & conditions drawn out by the management of COCOSCIENCE SDN BHD will override existing COCOLAB Loyalty Rewards Program terms & conditions.